aka Insurance Salesman does good! Ralph Plaisted was an insurance salesman from White Bear Lake, Minnesota who had some polar experience, or near-so, from hunting and fishing in the great Northwest. He and some friends were discussing snowmobiles in the mid-60's, and one of the men jokingly said something to the effect of if snowmobiles were so good, then why not just go on through to the North Pole? Though just in jest, that thought began percolating and Plaisted began his research and planning. He obtained support from both Canadian and U.S. sources, including the Canadian Air Force and Columbia Broadcasting Company, which sent a film crew and reporter. In March 1966, he got permission from the Canadian government to try it, and he got sponsorship from a company that manufactured snowmobiles, Bombardier Ski-Doo. They gave him ten production models for his first attempt in spring of 1967. 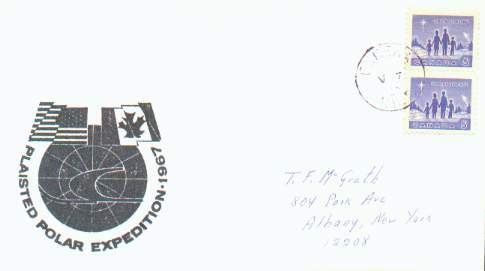 Plaisted had the finest of ham radio and other communications gear, and fuel and supplies with which to rendezvous with on the ice pack, but they found the 1967 attempt a bitter disappointment. They left Eureka, NWT on March 28, 1967, hoping to be the first party to be confirmed as making it to the North Pole. They had to turn around on May 4, 1967 at 83º 50' North*, which is roughly 370 nautical miles from the North Pole. The snowmobiles had performed nobly. 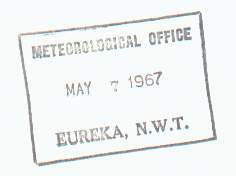 It took a seven-day blizzard to finally halt that year's effort, and this cover was carried with the expedition as philatelic mail and mailed on the way back, at Eureka, Northwest Territories on May 7, 1967. This is the marking on the backside of the above cover. Plaisted tried again in 1968, this time with snowmobiles with 16 horsepower engines, new traction modifications, and just plain better. The obstacles they ran into were quite similar; snow, wind, cold, choppy ice, open water leads for 474 miles as the crow would fly, if crows flew in the Arctic, but ending up more like 830 miles as they had to do it with all the detours and drifting of the ice packs. Four men eventually ended up going all the way! - Ralph Plaisted, Walt Pederson, Jean Luc Bombardier and Jerry Pitzel, all of whom were "amateurs", not a professional arctic explorer in the bunch. They left Ward Hunt Island (Ellesmere Island) on March 7th and 43 days later on April 20th,** 1968, they reached the goal... as verified by the U.S. Air Force. Shortly after they got there, an Air Force plane was circling their position, and two Air Force navigators, using gyro-compasses, checked out the fact that the four-man party was indeed at 90° North. Peary only had a theodolite, a compass and his own observations as proof, but Plaisted had the authority of the United States Air Force behind his claim. Some polar purists were said to have discredited Plaisted's accomplishment, saying that to go to the Pole by snowmobile wasn't an adequate challenge. But the world had not heard the last of Plaisted. This was not the last time Plaisted was connected with a polar event, however. According to an article in the Montreal Gazette of March 7, 1985, Plaisted was a support team member for the 1985 McGuire Polar Expedition. In that article, Plaisted noted that the temperature at Ward Hunt Island, where the expedition set off from, was at -47° C.
* Again, there is a slight discrepancy on the coordinates. Ice Cap News reported Plaisted's position as 83 degrees North, and 36 minutes. ** Note: My clipping taken from the Old Farmer's Almanac says it was April 19. ASPP has it down as April 20. Can anyone clarify the discrepancy?